I’m quickly learning that there are complex hieracharies and gradations of the food centre, food court and mall dining options across Singapore. At a basic level, some of this is to do with the divide between air conditioned or not, which is a major consideration in the humid heat of the day, but there’s also the usual neighbourhood and fanciness levels, too. With my Singapore local expert Vikki once more my guide, we ventured to a mall near Jurong East called Westgate, which felt like a pleasing Kipling violation. 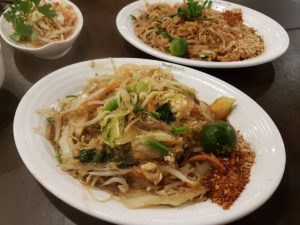 We wandered to their food court – called Food Republic – which had a much more slick and westernized feel to it than the food centres, with a broader regional selection of food, from local Singaporean to Thai to Korean to Chinese and Indian. We opted for Thai and joined the short queue at the Famous Thai Street Food. Their fame hadn’t reached my ears but apparently they have four branches in a small chain. We found them in a considerable state of disorder with front of house and the kitchen absolutely bawling at each other and not in that sometimes creative exchange of forthright views sense. There were tears and snotters, and it all looked to be over one slightly misordered plate of pad Thai. Rather than seeking cover, we awaited the calming of the storm then very gently ordered from the cerise-border-eyed counter woman. She regained her calm and with assurance placed our order with the compact little kitchen. Vikki was kind enough to pay the S$15 dollar bill. 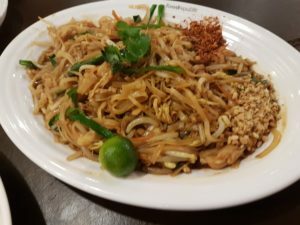 We had ordered a veggie pad Thai (which proved very helpful in resolving the wailing and gnashing of teeth behind the counter), a portion of seafood glass noodles, a mango side salad and a side dish portion of tom yum soup. Everything turned out to be pretty good, with generally fresh, brightly spiced dishes. The standout was the tom yum soup that had a comforting vibrancy to it. 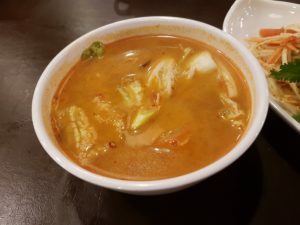 The noodle dishes were less memorable, although the seafood with the glass noodles was well cooked, and the salad packed a really pleasing punch. So overall, we got dinner and a show for a very reasonable pricetag at the Famous Thai Street Food counter at Westgate’s Food Republic. They served us just the kind of meal we were looking for after an enjoyable turn around the nearby Chinese Gardens. And we hopefully did our best to contribute a little calmness to the sometimes frenetic operation.